The Mary Rose was an English Tudor warship, the pride of the Royal Navy and apparently King Henry VIII’s favourite warship. What an odd idea that is. Â You are I might have a favourite song or TV show, but not many of us can stand back and say, “of all my warships, this one is definitely my favourite”. Built in Portsmouth around 1510 the Mary Rose saw active service for over 30 years, and over that time saw its fair share of sea battles. Â Armed with no less than 78 guns, which increased to 91 after it was upgraded in 1536, the Mary Rose was one of the first ships to be able to fire all it’s broadside cannons at once, making it a force to be reckoned with. So what is a 16th century boat doing on a web site devoted to the 1980’s? Â Well, I’m getting to that. 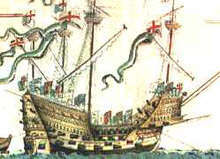 Â In 1545 during a battle against the French the Mary Rose was sunk in the Solent. Â It lay at the bottom of the sea for the following centuries, briefly being discovered in 1836 before being forgotten about in 1840. Â The sediments at the bottom of the sea covered the wreck, and it wasn’t until 1967 that sonar was used to rediscover it’s resting place. Â In 1971 weather conditions caused the wreck to be partially uncovered, and it could be studied by scientists. In 1979 the Mary Rose Trust was formed with the aim of bringing the ship and it’s rotting timbers to the surface, and in 1982 this dream became a reality. Â Blue Peter followed the process in agonising detail as one of the shows more educational features, showing the usual artifacts such as bottles and combs so beloved of archaeologists. Â We also learnt how the timbers of the ship would rot away completely if they were kept under the right conditions, which in practice meant a giant fridge had to be constructed to keep the vessel cool whilst spraying it with seawater to stop it drying out. The broken hulk of this once great ship has since been through many different treatments to keep it preserved, and if you’re ever in the Portsmouth area you can go and see it for yourself as it is on display there. Â A campaign is currently running to raise funds to build a purpose designed museum to house the Mary Rose, so for more information on this and the ship in generally, visit the The Mary Rose website. This entry is filed under Miscellaneous	and was posted on April 7th, 2009. You can follow any responses to this entry through the RSS 2.0 feed. You can leave a response, or trackback from your own site. Lord! That brings back memories. I recall seeing the BP footage of this, aged about 13 and being a huge Henry VIII fan being beside myself with anticipation for the sight of his flagship, fondly painted in my mind as being a riot of colour and treasure. I have to say I was completely despondent when the soggy timbers finally showed above the waves. I appreciate now that it was living history (and I’ve seen the original since at Portsmouth). But at the time, teenage philistine that I was, I really couldn’t see what the fuss was about! It was a bit of an anti-climax wasn’t it, when a few bits of wood were dredged up that didn’t really much resemble a boat. Still, an impressive engineering feat! Thanks Jane, glad you like the blog. I remember that well- our telly broke down half way through!! We had to watch the rest on the tiny black and white set from the kitchen, which my dad rigged up in a hurry in the living room balanced on a stool!! Hello Lousy Lady. First and foremost this site is meant to jog peoples memories about when they were growing up, rather than as an educational resource, but I see where you’re coming from. For posts such as this one a few extra pictures certainly wouldn’t go amiss, so I’ll see what I can do in that area. wasn’t the Mary Rose featured quite a bit on Blue Peter at the time? Yes, it certainly was. They followed the story quite closely as I recall, giving regular updates on the ship as it was meticulously examined and preserved. Blue Peter was always a bit like that though, wasn’t it? I remember them making a big thing out of the fire at York Minster as well, with a competition to design some new ceiling ornaments.